I’m betting you get 15 different answers. Over and over again, coaches point out still positions and attempt to validate their points. However, nobody ever discusses the role of the hips. It’s always either the arm or the legs.. Right? Triple extension is the key to velocity. 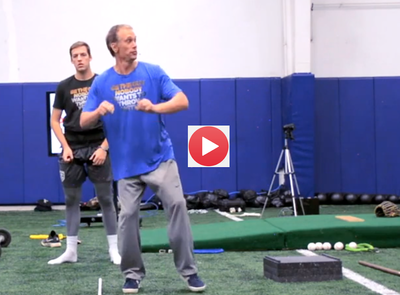 Getting your upper body to form the Letter C is the key to velocity. Lock out your front leg. Sadly if you tried any of those keys, most of you would be locked out of velocity. Because your arm health and velocity is dependent upon the OTHER-HALF, not the lower-half. It doesn’t matter if you cannot connect the lower and upper-body. It’s the hips/pelvis which drive the movements. It’s the hips/pelvis which connect the upper to the lower-body. And it’s the action and efficiency of the hips which will determine the action and efficiency of the arm. And it’s the hips/pelvis which act as the go-between to the upper and lower. So, regardless of what you’re doing to train your arm or leg drive, if you can’t control the center of your body? You’ve got a much higher chance of getting hurt than you do of throwing the ball harder. Your arm is at the mercy of your hips. I understand the concept and have tried having pitchers and hitters feel the Pelvis during rotation process. Trying to find ways to help them feel it and use it. Want to the how to help pitchers feel this rotational process. Are you wanting to know how to get pitchers to FEEL this? Is that the question? If so, that’s an easy one. Follow the 5.0 Core Velocity Program. That’s the #1 goal of the entire program. Honestly, I don’t think there’s another way and that’s no BS. The ability to FEEL requires a mind-muscle connection referred to as proprioception. And there’s not a drill in the world that can do that. 2. FEEL the hips perform basic movements.. Without proprioception (ability to feel hips) there’s no way to coordinate the movements. 3. After you can FEEL and coordinate the movements you begin putting them into motion with the goal being synchronized motion. And that’s the process we use, exactly. You’ve got to realize that the delivery is made up of several sub-movements required to be embedded… before you do anything like this. Problem is, people don’t view it this way… They think a pitching drill resolves every issue. Couldn’t be further from the truth. could you go a little more in depth on what that means and possibly some exercises or tactics on how to do that better? The key to the video is a combo of hip proprioception (Mind-Muscle connection) and coordinated movements syncrhonized into efficient motion. A long story short, there’s no pitching drills that will create this… It’s the primary purpose of the Core Velo Belt and we go in-depth in the 5.0 system.